Welcome! We are glad you have selected our practice website to explore your rheumatology concerns regarding arthritis, musculoskeletal conditions and osteoporosis treatments. We want to be your partner in helping you live a healthy life! We care about your needs and want you to feel comfortable in our care so we can develop the most comprehensive treatment plan possible, specifically for you. Please let us know what your needs are so we can develop the most comprehensive treatment plan possible. 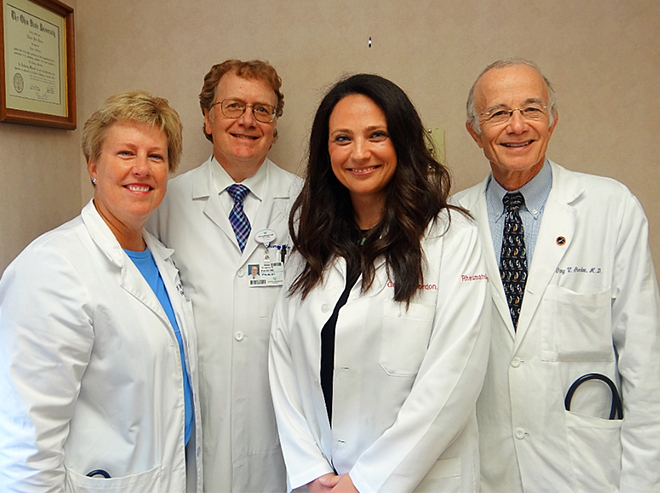 Our practice is a kind, compassionate, caring environment where patients always come first. I think most physicians probably would say “No” to television drug commercials. There are frequently mixed messages with the commercials’ optics, and narrative. Some medication information can really frighten or confuse viewers, scaring them away from taking medications which might be really helpful in their treatment. At the end of these commercials, there is the rapidly announced list of terrible, potential drug side effects but in reality, most of them are extremely unlikely. For example, the biologic drugs, Humira, Enbrel and Remicade, as well as the newer medications such as Xeljanz, can, in theory, cause viral hepatitis or tuberculosis. However, of the hundreds of patients I have treated with these types of drugs, I have yet to see one case of tuberculosis or hepatitis. Why are these potential side effects listed? The listing is a Federal Drug Administration (FDA) mandate, and it is hard to argue with the FDA that’s just trying to protect the public. However, it is difficult for somebody watching TV drug commercials to know the likelihood of these possible side effects. If the consequence of untreated rheumatoid or psoriatic arthritis is that a patient may be crippled and unable to work, a small 3% chance of infection may be a worthwhile risk. Medical providers are risk averse; we want patients as healthy as possible, and living a good, quality of life! But an everyday reality is when you get out of bed, you could be exposed to a potential hazard; driving your car to run an errand, getting on a train or plane, or even just walking to the mailbox. Medical treatment with medications is also about weighing the risks against the benefits. With professional medical guidance, we all aim for the right decision. Having a complete and honest discussion with your rheumatologist about the benefits and risks of your prescribed medicines, is the reasonable approach. As far as these TV drug commercials, next time just hit the MUTE button on your remote control! We hear many patients say, “My knees hurt.” Adults of all ages can suffer knee pain, but a little prevention can go a long way. Read this practical “all about knees” guide to pain, prevention and exercises that can help keep your knees working for years to come.